Paul Braithwaite, Stefano Casalotti, George Coulouris, Jean Dollimore, John Hartley, Meade McCloughan, Alec McKinnel, Chia Seiler joined the first inspection ride on Saturday 19th March. We looked at a potential link from Bidborough Street to Argyle Street. There should be an opportunity when the Argyle Street site is redeveloped – or when the Council vacates the Town Hall Annexe which will be a lot earlier. After noting that Bidborough and Hastings Street are one way, we moved on to Regents Square whose west side is part of a signed route from Tavistock Place to St Pancras and Kings Cross stations. The link was upgraded and signed after our demo when St Pancras Station opened for Eurostar. 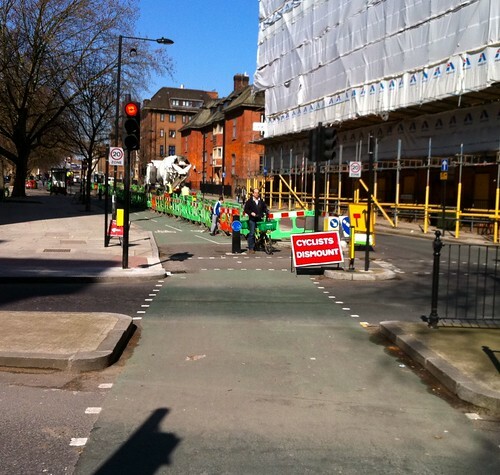 It is important to this link that two way cycling should be possible in Regent Square. We then rode through the off-road link to Harrison Street and on to Argyle Street and Argyle Square. A notable feature of this area is the convoluted tangle of one-way streets. 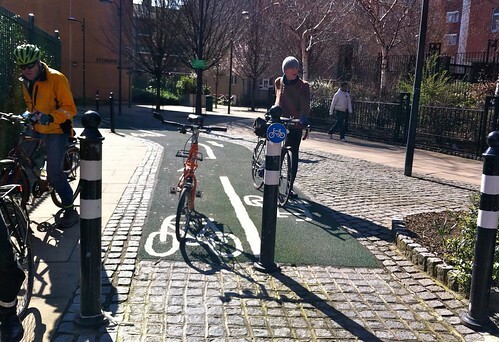 Camden Council haspromised to implement two-way cycling in all of the streets between Euston Road, Judd Street, Regent Square and Grays Inn Road. We’re expecting implementation to start within the next year. A lightweight approach (signs only) will be used. We crossed Euston road between Argyle Street and Pancras Road, using the very useful link through the central reservation and into the ASL. Pancras Road was chaotic due to the current work on relocating the gas holder to Goodsway. But the chaos doesn’t excuse the total lack of street bike parking near to the German Gym. 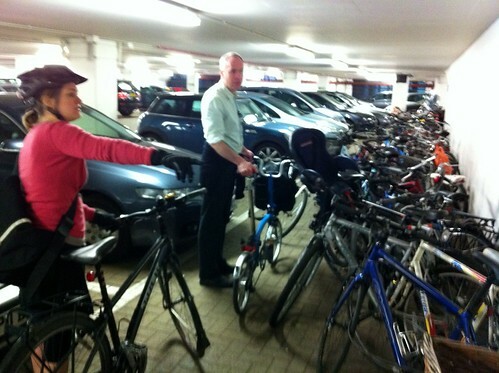 We then went to inspect the bike parking in St Pancras Station, which is in the car park. Although well signed from inside the station, there is no signage from Pancras Road (via the Coach Road, which is pretty hazardous). The ground floor stands had 3 bikes on each and the upstairs one 2 each. We left via the car entry (crawling under the barriers). We rode up Camley Street to look at the new link through to Agar Grove. People who hadn’t seen it before were duly impressed. We turned south via Royal College Street and discussed the Cyclists Dismount signs. 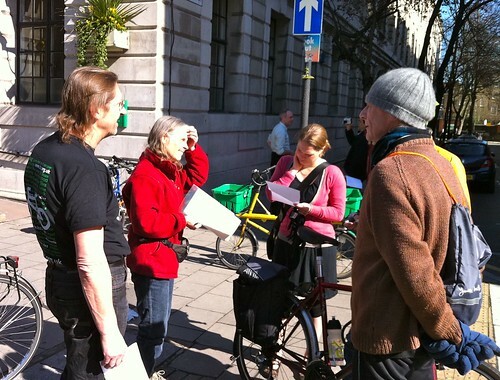 We stopped in Brill Place outside the UKCMRI building site to discuss future bike parking and cycle hire station. There is adequate bike parking on Midland Road. Our last stop was at the junction of Marchmont Street and Tavistock Place. We noted the new arrangements in which motor vehicles are not allowed to turn left (northbound), so cyclists now get a proper green phase. It seems that taxis and other vehicles are disobeying the new rule and Camden has implemented a big build out to make the manoeuvre difficult.